in der akademischen Welt nennt man diesen Aufruf Call For Papers – hier muss es wohl folgerichtig Call For Films heißen. Gesucht werden Super 8 Filme für das Filmfestival Détours, das vom 20. bis 23. Juni 2008 in Santorini, Griechenland stattfindet. “A maze of tiny streets and short movies. 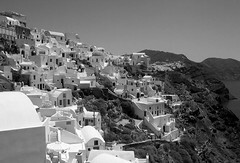 For a few hours, a few nights in June, short stories, moving images, words, colors, and black and white shots will adorn the white walls of the Greek village of Oia, in Santorini. Super 8 projectors will be scattered in different spots throughout the village. The white walls will become natural screens and images will be floating in the streets. Get a map. Get lost. Wander around one of the most beautiful villages in Europe and enjoy short films from both amateur and professional filmmakers worldwide. You’re invited to share your work and join us in June when your entries will be viewed by an international audience, crossing language barriers and thus bringing people together to appreciate the not-so lost art of Super 8 filmmaking. Wer möchte nicht den eigenen Film auf diesen super-megaperls-wäsche-weißen Wänden sehen?! Also schickt fleißig eure Super 8 Filme ein – send in your Super 8 films!!! This entry was posted in festival, film. Bookmark the permalink.